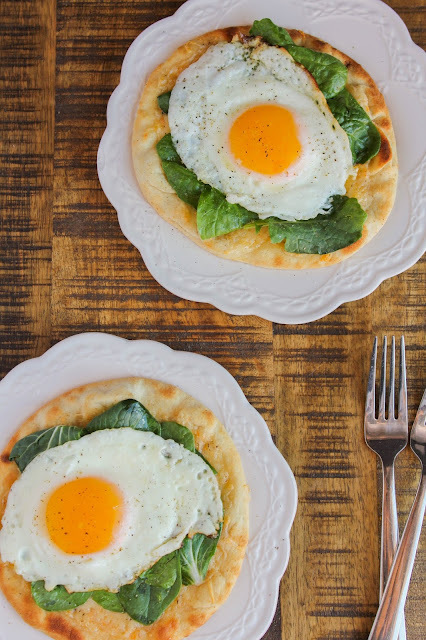 These delicious Crispy Breakfast Pitas are made with fresh ingredients and couldn't be easier to make! They'll be the perfect addition to your next brunch menu. I know what you're thinking....I must have an obsession with sunny side up eggs. Or "squishy middle" eggs as my kids call them. 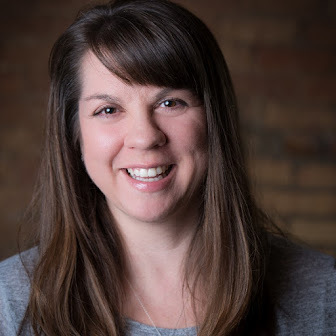 Two recipes that include eggs this week? Yes friends, it's true. I do love me a good "squishy middle" egg. 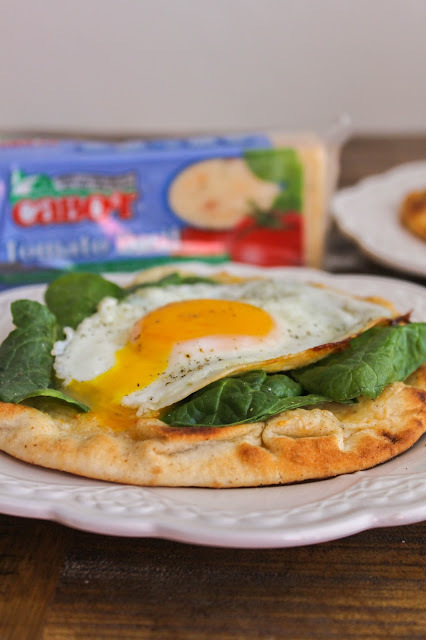 Especially when it's atop a crispy pita bread, melty cheese, and fresh greens. I mean, what's not to love? It truly is the perfect combination. I used Cabot Tomato Basil Cheddar Cheese for these pitas and I'm so glad I did! It adds such an amazing depth of flavor from the sweet tomatoes and little bit of basil. I'm not sure you can even see the cheese in these pictures, but I promise it's there! It's just hiding under the greens. So, have you entered the MEGA #BrunchWeek giveaway yet? If you haven't, what are you waiting for? You are missing out! We have 8 prize packs to give away, with fabulous items like baking sets, knife sets, a Ninja® Mega Kitchen System®, and so much more! 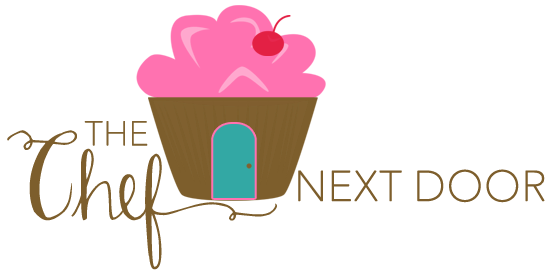 Check out my first brunch post of the week to read all about our sponsors and what they're giving away, plus enter to win! I hope you've been enjoying my #BrunchWeek recipes so far. I sure did have a blast making them for you! Be sure to check out the recipes my #BrunchWeek pals are sharing, too. I've got a list of everything I can't wait to try, and that list is getting long! 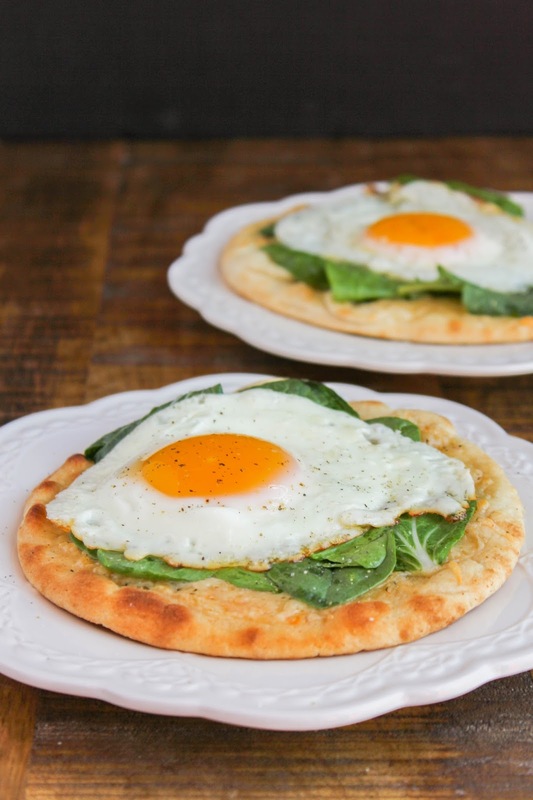 OK, are you ready to make these breakfast pitas? I'm getting hungry! Preheat the broiler. Place the pitas on a baking sheet and place it in the preheated oven. Broil for 3-4 minutes, then flip the pitas over and broil the other side for an additional 3-4 minutes, until both sides are lightly brown and starting to crisp up. Remove from the oven and sprinkle about 1/4 cup of the cheese on each pita. Place the pan back in the oven and broil for 2-3 minutes, just until the cheese melts. Set aside. In a large skillet, heat the butter over medium-high heat. Crack the eggs into the pan, one at a time, and sprinkle each with salt and pepper. Cook until the edges are done and the center is just set. Turn the heat down to low and cover the pan with a lid. Cook another 2-3 minutes, until the eggs are cooked but the yolks are still runny. Add the spinach to a medium bowl. Squeeze the lemon juice over the spinach and sprinkle with salt and pepper. Toss to combine. 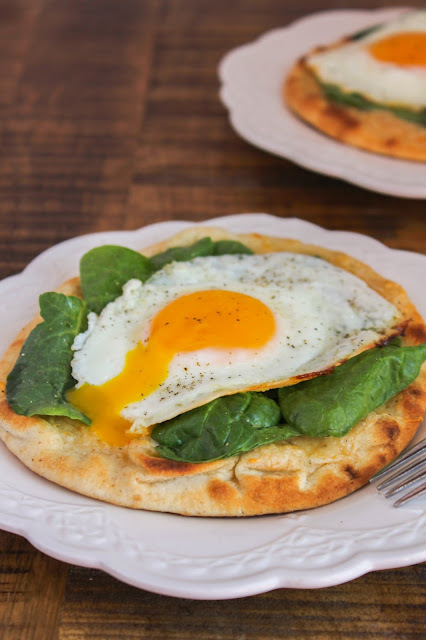 Divide the spinach mixture evenly and place on each pita. Carefully top with an egg on each, and season with salt and pepper. Serve immediately.